Improved soil counting for all types of linens including shop towels, uniforms, medical and restaurant linens. 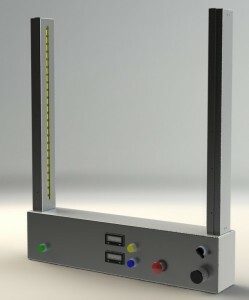 A counting system consisting of one stainless steel light frame with a mounted light array bar for sensing linens or other items. Also included is a 110 VAC cord connection, an audible count beep indicator and manually resettable digital counters.